Okay, I’m just going to put it out there: I do not like fruit pies. The high fruit-to-crust ratio is just not my thing. Neither are the syrupy soft thick hunks of fruit. A crostata, on the other hand, I love. There is a perfect amount of crust with an even layer of fruit that is cooked tender and thin. A crostata couldn’t be easier to make, you literally fold the dough over and create your own shell. No need to deal with a fussy pie lattice or crust. As for the fruit, I chose pluot because, if you haven’t noticed lately, the YUM team has been sort of obsessed with all things plum. Pluots are a cross between a plum and apricot and are all over the place right now. 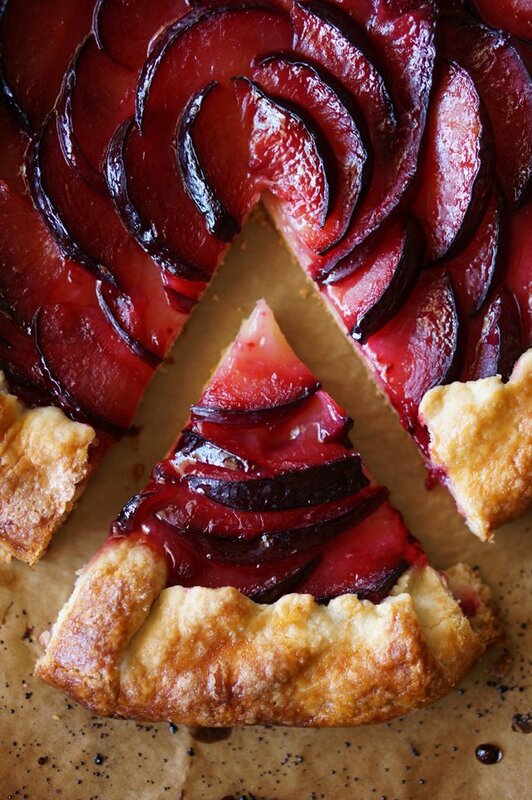 The additional flavor of ginger makes this pluot crostata sing. 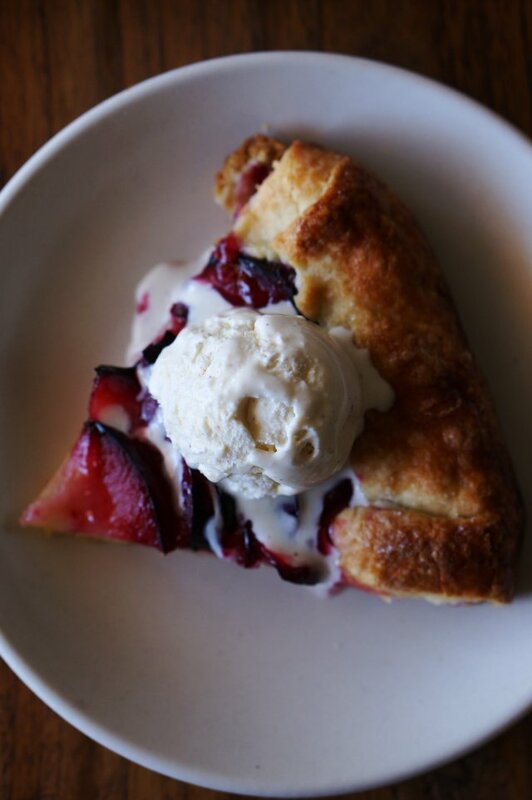 Topped with a scoop of vanilla ice cream and you won’t ever eat pie again. Or at least I won’t. 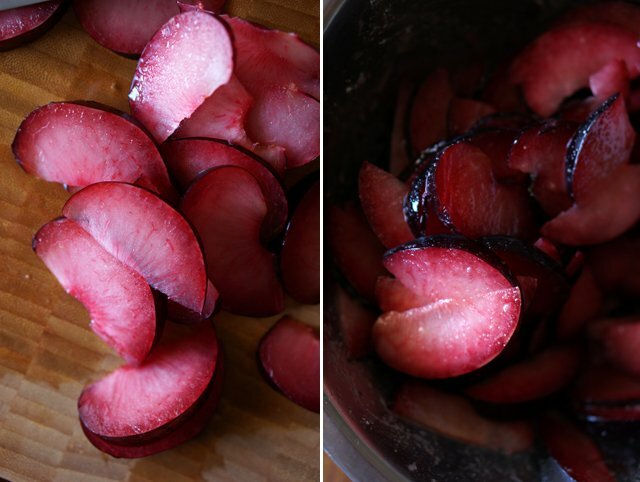 Pit and thinly slice the pluots. Toss with the 1/3 cup of sugar and corn starch. Grate the ginger on a microplane grater and strain through a small fine-mesh strainer. Using the back of a spoon lightly press the grated ginger against the strainer to release the liquid. Discard the dry fiberous ginger. Add 2 teaspoons of ginger juice to the pluots and lightly toss. 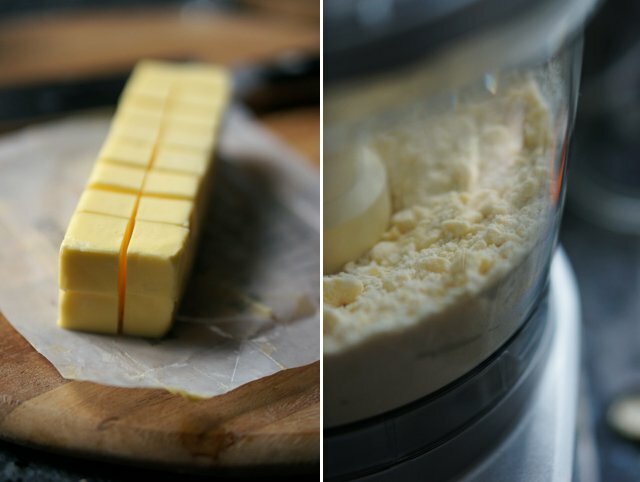 To make the dough, cube the cold butter. Add 2 tablespoons of sugar, 1/4 teaspoon of salt, and 1 1/4 cup of flour to the bowl of a food processor. Pulse to combine. Add the butter and pulse until the butter is about pea sized. Add the water and pulse until the mixture barely comes. Shape into a flattened disk and wrap with plastic wrap. Refrigerate for about 30 minutes. When you are ready to bake the crostata, preheat the oven to 425. Roll the dough out on a lightly floured surface until the dough is about 12 inches in diameter. Transfer the dough onto a baking sheet lined with parchment paper. 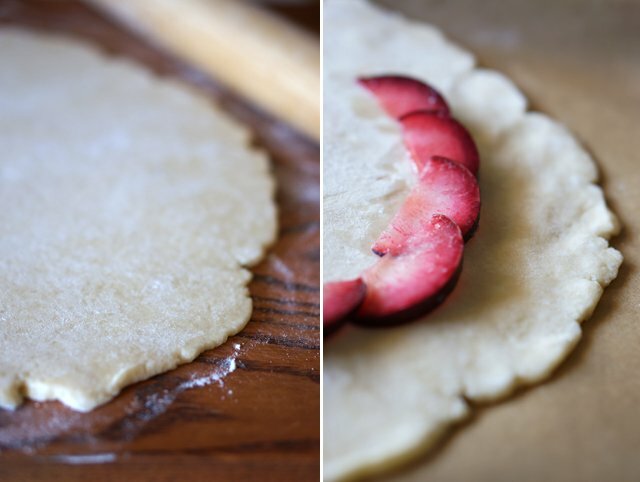 Fold the edges over the fruit and brush with the egg wash. Sprinkle sugar over the crust. Bake for about 45 minutes until the crust is deep golden brown. Slice and enjoy with a scoop of vanilla ice cream! Thank you for the beautiful recipe, I never considered the ginger, but I love it! OMG! this is a fabulous recipe. I would love to try it. I was wondering that can this be made in a microwave and what should be the temperature and time for it ? hope to make it soon. Being a newbie baker, I was wondering what temperature should be used to bake the galette. I can’t seem to find it. Thanks so much for a scrumptious recipe! It’s in the text, at 425 degrees. Hope you enjoy it Barbara! Did one similar but with blackberrys and lime instead of pluots and ginger, and it was delicious too! Wonderful! Blackberries and lime sound like a great combo too. Glad you enjoyed it! 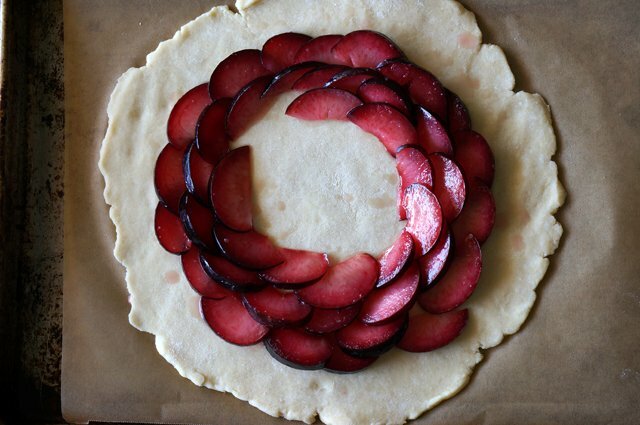 That galette is just stunning! 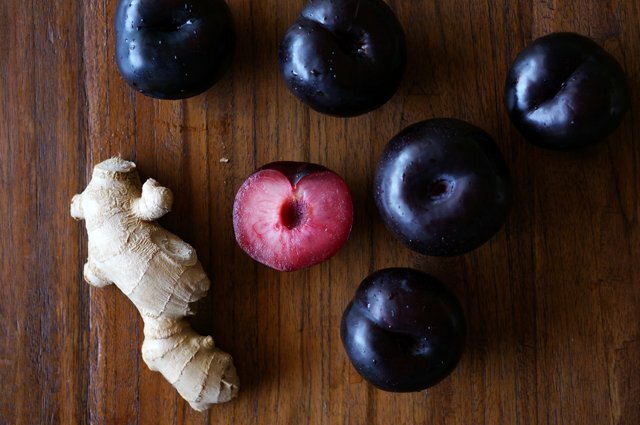 I love ginger with plums/pluots – the flavors work together so well. Exquisite photos. I hope to make this soon soon soon! OMG, we just made this. It was so good! i couldn’t find pluots in wholefoods so i opted with apple and plum. i want to make it with fig next time if i see any. This is so easy to make! Thanks Peggy! 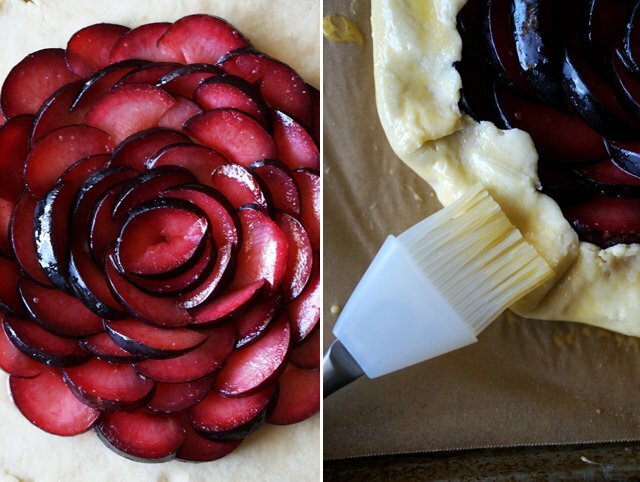 I saw your photo of it on Instagram– gorgeous with the half apple, half plum! This recipe is just so lovely and I definitely want to try it once I find some vibrant in-season fruit for it. I was wondering: When you pick the fruit, is it at the peak of ripeness or a little under-ripe? And would you have any pointers on how to slice/pit the pluots (or any other fruit with pits) and still maintain that great crescent shape that I see in your photographs? I think the shape of the slices will determine how well the “flower” effect turns out. Love your blog! The work you all do is truly an inspiration. Thank you so much Christine! Great question– the pluots should be ripe but firm. When slicing them, cut along the pit so you split the pluots in half and remove the pit. Slice into thin wedges like you would an apple, except thinner. Hope that helps! Looks amazing!!! Could i ask you what kind of camera you use? I’m curious. I’m starting learning photography and I don’t know which DLSR to buy as a first timer. Thanks! Thanks Bridgette! I actually am using the Sony Nex 6 with a 50 mm lens. It’s one of those new mirrorless cameras that are smaller than a DLSR and I love it! I had a Canon DSLR and ended up switching because I found it was such a pain to carry around. 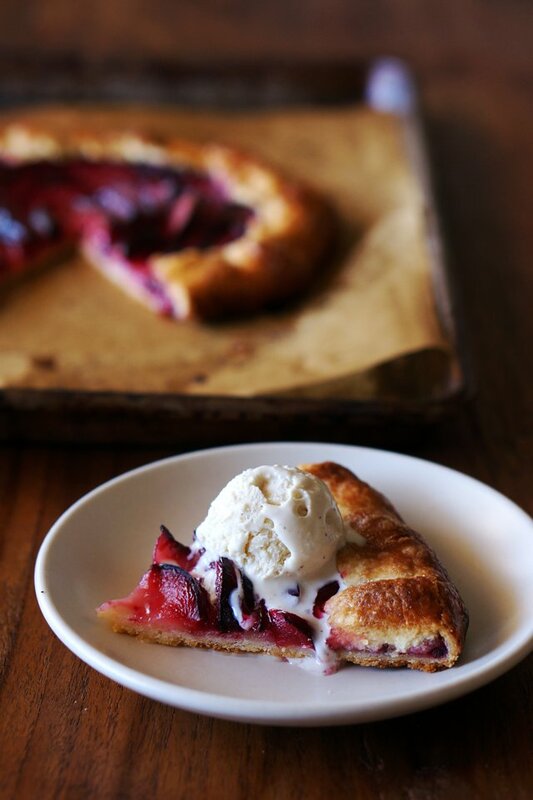 Ginger and pluots in a crostata sound delicious! I will have to try this out soon. Great photography ! Wow these are beautiful! I love the combination of plum and ginger. Pluots and ginger is one combination I haven’t tried, but these photos are doing a good job in convincing me to do so as soon as possible! I’ve always been a sucker for the pie crust anyway, so crostata just ups the ratio of the good stuff 🙂 Thanks for this recipe. seems so easy! i am going to make it this weekend for my hubs! 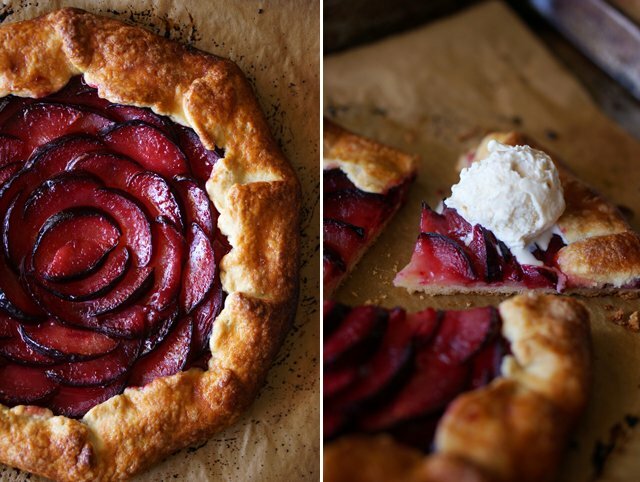 I’ve never heard of a pluot before or a crostata, but this looks divine! What other fruits can be used with this recipe? It looks wonderful and I LOVE fruit pies! I’ve used plums, peaches and berries before. All really great in a crostata! You killed this pie with beauty! It’s so darn pretty. I love the layers going outwards, it’s just… perfect! I am with you when it comes to fruit pies and all the fuss. I’m obsessed with crostatas. Savory, sweet…it doesn’t matter. I just adore them. And the crust on this one looks perfect! Looking forward to trying this soon! I’m with you – I dont like fruit pies – I’ve never had one expect the first time I tried apple pie! Crostata is definitely the better alternative – and I love the addition of ginger to sweet dishes.That slice looks like a pizza – my other favorite “pie” ! Thanks! And so glad I’m not alone on the pie distaste! Your photos are just… GAH! So beautiful and inspiring! And this crostata has me hungry! Is there an easy way to print these recipes? It looks delicious but I’m afraid I’m a bit old fashioned and still keep a recipe binder. I’ve been having to copy over to a word processing document and then making a PDF. I’m sorry Ana, not right now, but we’re considering putting that feature in soon! This looks amazing! Do you think it would work with just regular plums? Thank you! Absolutely! Regular plums would work just fine in this. I too much prefer a crostata over a pie. This looks divine. This looks so simple and yummy, thanks for sharing! I will never give up pie…but this looks so amazing. It might make me forget about pie for just a second. And then another second while I have another slice! Best Brunch Recipes to Impress Your guests! – Home. Made. Interest. 15 Best Brunch Recipes to Impress Your guests! – Home. Made. Interest.